Here’s a lesson in when to post and when to email. Over at the Blackboard, Lucia couldn’t make sense of David Evans’ post on partial derivatives, but instead of emailing us or commenting here, she published her unresearched thoughts and and asked her readers instead. Only most of them didn’t know either and it didn’t help that the quotes were misattributed, and Lucia’s assumptions were wrong. Together they generated a thread of fog, arguing about irrelevant points in maths and models that didn’t apply. Having admitted that she is confused about what David was saying, in comments she went ahead and called him confused, declaring he didn’t understand maths, and was spouting nonsense. (Steady on Lucia.) In the nicest possible way David explains he’s right, she’s wrong. And he had defined and cited everything correctly too (it was all in the post, or linked to it). We all could have saved a lot of time if Lucia had read the post carefully, or just asked before publication. We’ve tweaked my introduction to the post to clarify things, but all the scientific points and equations David raised remain the same. She is, of course, welcome to come here and comment. We hope the Blackboard will give us more useful feedback next time. Just to remind everyone, the point of Post 4 was that the implacable confidence of climate modelers who say it’s “basic physics” is based on partial derivatives of dependent variables that might be close enough, or might be quite wrong, no one can tell. The advertising doesn’t fit the product. Lucia Liljegren thinks I made a mistake with partial derivatives in Eq. (2) of post 3 of the “New Science” series of blog posts when describing the conventional basic climate model. She also had difficulty understanding post 4 about the use of partial derivatives in the basic model, and thinks Eq. (1) of that post or the text just around it is definitely wrong. Having read carefully through her post and its comments, I fail to see she found any mistakes in my posts or even made any informed criticism of them. Joanne and I have emailed her and tried to point out her mistakes, but she ignores any content and insists only that I made a mistake with partial differentials and that she only wanted to discuss it in public. Ok, now we are discussing it in public. Lucia is principally responding to post 4, which criticizes the conventional basic climate model for relying heavily on parameters that were partial derivatives that do not technically exist — because it is impossible to hold all but two of the relevant variables constant in climate, due to their web of inter-dependencies. The partial derivatives are not empirically verifiable; hence, an unknown error is incurred by using them. 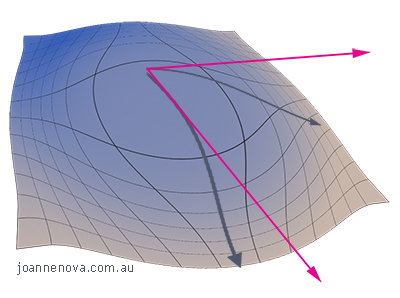 The Planck feedback, the change in OLR with surface temperature, when all is held constant. (Not quite everything else is held constant. The generally accepted way of doing this is described in Soden & Held, 2006, pp. 3355-56. The Planck conditions are that all else besides tropospheric temperatures and OLR are held constant—so there are no feedbacks, all tropospheric temperatures (including the surface temperature) change in unison, and stratospheric temperatures are unchanged. There are some arbitrary choices to be made, such as whether it is the specific or the relative humidities that remain unchanged as the tropsphere warms, or what happens at the tropopause.) Value: 3.2 W/m2 per K.
The change in OLR when the CO2 doubles, holding all else constant. Value: 3.7 W/m2. So, there is a specific context, a specific model, and two specific partial derivatives. The blog series is about the conventional basic climate model, as explained in the introductory post 1. That model is described and derived in post 2 and post 3. While there might have been some misunderstanding from Joanne’s introduction to post 4, any doubt would be dispelled by the first sentence of my article in post 4: “There are three significant errors with the conventional basic climate model (which was described in the basic climate model core part 1,and basic climate model in full part II)”. Lucia also says the claim that “effectively climate models model a hypothetical world where all things freeze in a constant state while one factor doubles” is untrue. No, the second partial derivative in the background above, the change in OLR when the CO2 doubles, does that, which is entirely consistent with the derivation of the basic model in posts 2 and 3. This definition of G does not change at any stage in my posts. In Comment 139725 Lucia claims that “And he [David] seem to alternate between definitions of G or whatever“, but I cannot see how any reasonable reading of the series of posts could lead to that conclusion. Lucia’s version of G is absurd: Why does G only depend on one driver, and not the others? Which driver — what is the value of i? G obviously depends on the feedbacks, which depend in turn on the temperature TS, but I chose to explicitly include the feedbacks as arguments of G, following Eq. (1) of Held and Soden 2000.
as per Eq. (2) of post 3. This result is essentially the same as Eq. (6) of Held and Soden 2000. Lucia has restricted the partial derivatives of G with respect to the drivers to only hold the surface temperature constant, which is absurd in any formulation because obviously the other drivers also need to be held constant. Lucia, in Comment 139725, says “But I definitely think this bit contains quite a bit of stuff that is wrong no matter how you interpret the notation“, and reproduces the entire section entitled “The Required Partial Derivatives Do Not Exist” from post 4. Not a very specific complaint. The section applies the formal definition of a partial derivative (such as in this Wikipedia article) to the partial derivative of G with respect to TS‍ at the initial steady state. The section makes the point that the climate states in that definition do not technically exist because they contain a changed surface temperature but all the other variables remain the same (surely Lucia is not suggesting they do exist?). The limit of non-existent numbers also does not exist; hence the conclusion that “the partial derivative does not exist, technically”. Seems pretty straightforward. The genre of the New Science posts is a bit experimental. High level maths/physics ideas are being circulated for feedback among a very mixed audience. So Jo does a casual intro for everyone, ahead of the heavy maths. Lucia mistook the intro for the maths, and carelessly missed the links and context below. She didn’t read the mathematics correctly either. The entire thread at the Blackboard is a scientific rabbit-hole (though Rud Istvan admirably tried to lift the standards, thank you Rud). We got some useful feedback about communication, but there are better ways to do that. [1^] Held, I. M., & Soden, B. J. (2000). Water Vapor Feedback and Global Warming. Annu. Rev. Energy. Environ., 25:441–75.